Sunday’s Run Around The Square in Goderich honoured two great men from Blyth with a long history of helping their community. The Dave Mounsey Memorial Fund hosted its ninth annual run on Sunday. Both the fund and the event were created in honour of former Blyth firefighter and OPP officer Dave Mounsey who was killed in a single-vehicle accident in 2006. Just before his death, Mounsey was raising money to buy a defibrillator for Blyth through a running event. 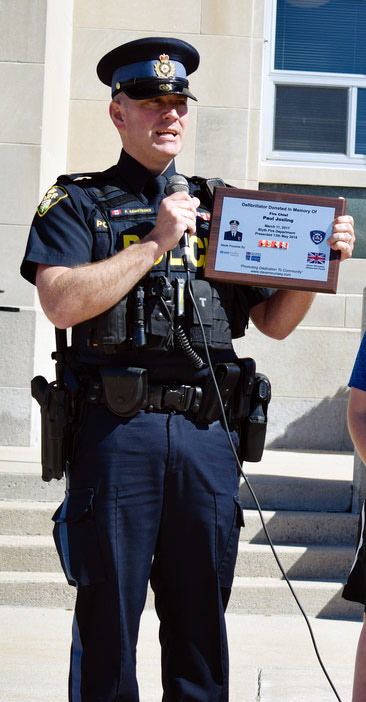 Since Mounsey’s death, the Fund, which was created by Mounsey’s OPP partner Patrick Armstrong and others who knew Mounsey, has now placed 90 defibrillators across southwestern Ontario. At every run, there is a donation in the name of a fallen first responder. This year’s donation was in the name of former Blyth Fire Chief Paul Josling, who passed away last year after a years-long battle with cancer. Not only had Josling served his community for decades as a volunteer member of the fire department, but he was one of the founding board members of the fund and a good friend of Mounsey’s. In an interview with The Citizen, Armstrong said it was an emotional day for many involved with the fund. He said he was honoured to be making the fund’s 90th defibrillator donation and hosting the charity’s ninth run, but on a personal level, donating a defibrillator in Josling’s name simply wasn’t a day he thought he’d see. Armstrong said that Josling never sought out recognition or the spotlight, so he felt he could hear Josling looking down on the event and grumbling about the attention he was being paid. “Paul always made it about everyone else, so today it’s fitting that we can make it all about him,” Armstrong said. Josling’s son, Jeff, also a North Huron firefighter, said it was an emotional day for him and his family. Jeff helped his father for years working with the fund and he said that he “lived and breathed” working for the fund and helping at events. Whether it was getting to Goderich early to help set up or doing what he could in his spare time, Jeff said his father was always there for anything the fund needed. Dianne Josling, Paul’s wife, said it was a very emotional day for her and her entire family after Paul had worked with the fund for so many years behind the scenes. The fund donated the defibrillator to Blyth Cowbell Brewing Company and General Manager Grant Sparling, in addition to running the five-kilometre route, was on hand to accept the donation. 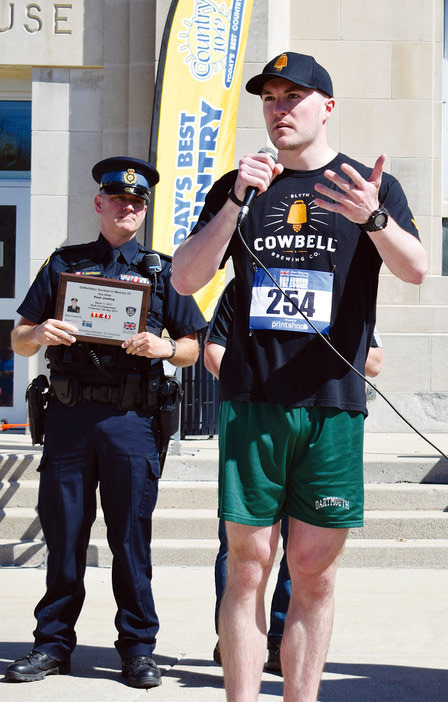 He said that while Cowbell’s Blyth location is already equipped with two defibrillators, one on each floor, the Mounsey defibrillator will be stationed in the location’s Threshers Hall when it’s not out with travelling Cowbell employees at the various events to which the company travels. Armstrong said that with the defibrillator being on the road with employees in a temperature-controlled bag, Paul will be there providing safety at all times. Sparling said he and the company were proud to be involved with such a great event honouring two great men from Blyth. He said that safety is the company’s top priority, so to now be able to provide a defibrillator wherever Cowbell goes just adds another level to the company’s ability to keep all of its patrons and employees safe. 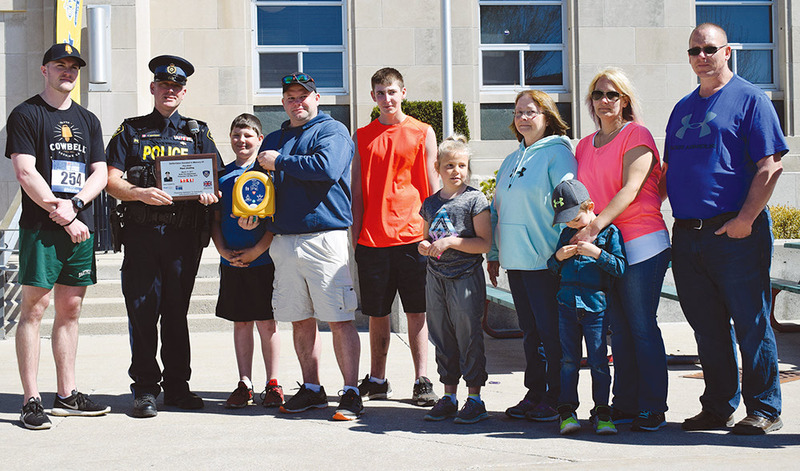 Nearly 350 people participated in the run, many of them local, however, the one who turned the most heads was North Huron firefighter Kelsy Long, who ran the five-kilometre route in full bunker gear with a picture of Paul fastened to her back. Long said that she knew she wanted to do something to honour Paul, but wanted to make it a little tougher on herself. “I can run a [five-kilometre run] off the couch any day, so I wanted to challenge myself,” she said. She said she did about five or six training runs, adding more equipment every time she hit the road. It was difficult, she said, especially on such a warm day. Whether it was running, rather than working, or the missing adrenaline of not being at a fire call, Long said it was difficult running five kilometres in the full suit, which is estimated to weight approximately 60 pounds. She did, however, finish the run in just over 37 minutes. For more information on the Fund or the Run Around The Square, visit davemounsey.com.